Corporations from industries as diverse as agriculture, manufacturing, logistics retail and financial services are being disrupted at an unprecedented rate by a variety of innovations: technological, e.g., cloud computing and big data analytics, startup creation, e.g., lean startup, investment model, e.g., crowd-funding, business model, e.g., offering software as a service, marketing, e.g., social engagement, product development, e.g., agile development, etc. Most of these innovations are created by startups, including many Silicon Valley-based ones. In the face of the rapidly changing innovation landscape, organizations such as R&D and Corporate Strategy that were traditionally tasked with predicting and creating disruptive innovations are not longer able to deliver in their mission. To come close to such innovations corporations need to be in the places where such innovations are created and be part of the ecosystem that generates and funds them. To be part of such ecosystems corporations must engage in corporate venturing, promote intrapreneurship be active with corporate and business development. These functions need to work in tandem and in collaboration with business strategy and corporate R&D. Silicon Valley’s ecosystem can play a big role in this corporate transformation. In addition to creating innovations, the members of this ecosystem develop best practices for: venture investing, building entrepreneurial teams and enabling them to reach their full potential, managing portfolios of startups, growing the most successful while pruning the ones that cannot scale, and finally successfully exiting from these investments through public market offerings or acquisitions. As a result, corporations are starting to invest significantly in Silicon Valley initiatives. In order to be successful with these initiatives they must understand and address a series of issues described in this paper. Traditionally corporate strategy organizations were tasked with analyzing market developments, emerging technologies and trends to formulate one or more plans for moving the business forward. R&D organizations were tasked with providing the disruptive innovations. Think of storied R&D organizations such as Bell Labs, Xerox PARC, and Kodak Labs. They were creating and patenting disruptive innovations addressing important existing and anticipated problems. These two organizations have been traditionally responsible for looking over the horizon. However, during the last 15-20 years, R&D organizations have become limited to providing sustaining innovations to existing revenue streams and business models. This may be due to the fact that many companies have outsourced R&D, reduced it, or completely eliminated it. But I believe that something more important is at work here. The traditional model calling for corporate R&D to be the main creator of disruptive innovation has become outdated. Within most corporations the innovation pace is lagging while the general pace of disruptive innovations is accelerating. For example, consider the disruptive innovation pace of companies like Google, Apple, and Amazon, and compare it to that of AMR, Gerber and Best Buy which may be creating sustaining innovations but are not known for their recent ability to produce disruptive innovations. High R&D spending is no longer a necessary and sufficient condition for making a company a disruptive innovator. 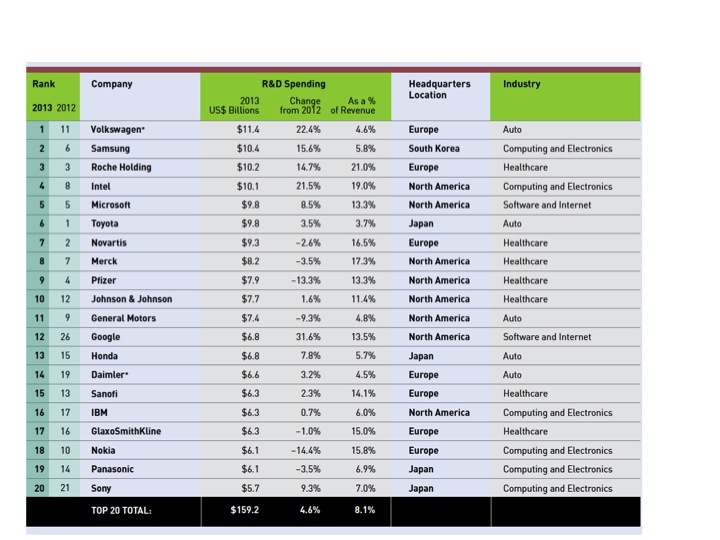 The annual surveys conducted by Booz & Co (see Figure 1 for the 2013 ranking) demonstrate that, with a few exceptions, a small number of the companies with high R&D budgets are considered disruptive innovators, since only four of the companies in Figure 1 are included in the list of the top 10 most innovative companies (see Figure 2). Is slow to respond to today’s rapidly changing market conditions. Cannot take into account the innovations being created in the various fields, including the technology innovations. Cannot address the reality that innovation is created around the world by small and large companies and not only in specific research laboratories. Is not customer-centric but rather technology-centric. Does not properly align business unit success metrics with those of the R&D organization. Lacks well-defined ROI metrics and often reverts to softer success metrics, such as number of patents obtained per year. Corporate venturing through which to have access to the global startup ecosystem and the innovations they create and to be able to invest in selected companies in collaboration with their institutional investors. Intrapreneurship through which to motivate internal entrepreneurs and fund the creation of internal startups, grow them outside the corporation and eventually spin-in back into the corporation the most successful ones. Strategic business development to enable partnerships with small and large companies that provide strategic advantage. Corporate development to drive strategic acquisitions of innovative companies regardless of their size distinguishing between companies that fill a product line and provide a sizable revenue stream, e.g., IBM’s acquisition of Cognos, and strategic acquisitions that drive disruptive innovation, e.g., Google’s acquisition of Nest or Facebook’s acquisition of Oculus, where the revenue stream may come a few years after the acquisition. Moreover, corporate innovation leaders must find a way to a) integrate these four functions and b) empower them to collaborate effectively with their internal R&D efforts. It is very instructive to understand how the new innovation leaders, e.g., Google, Facebook, Amazon, have incorporated these principles into their innovation work. For example, Google Ventures, one of the most active corporate venture investors, closely collaborates with the company’s corporate and business development organizations, as acquisitions of companies like Nest clearly demonstrate. Moreover, to promote intrapreneurship Google organizes engineers in small teams and allows them to develop new ideas for a period of time every week. Venture funds, e.g., Comcast Ventures, which collaborate with local institutional venture investors and invest in their portfolio companies. Incubators, e.g., ATT Foundry, which provide entrepreneurial teams with resources, e.g., office space, and mentors as they try to develop solutions that address what the corporation thinks as important existing or future problems. Accelerators, e.g., BMW, which in addition to what is offered by incubators they also provide seed funding, typically to intrapreneurs. Business development offices, e.g., Deutsche Telekom, that develop partnerships with Silicon Valley-based companies that are viewed as strategic to the corporation’s goals. R&D centers, e.g., Nokia, which capitalize on the local technology talent in order to create disruptive innovations. Some companies, e.g., Samsung, have established all of the above. However, the majority of the companies run these organizations as independent entities rather than as high performance, integrated disruptive innovation-creation engines. Ensure broad and strong executive support for the new innovation model. Staff the Silicon Valley operations with the people who have a passion for these activities and understand how to engage with the ecosystem. Establish the right timeline during which to measure success and make it consistent with other corporate timelines. Most corporate investments in Silicon Valley-based startups, as well as the startups being incubated should be viewed with a 7-10 year time horizon. Large corporations often cannot understand this long time horizon, whereas institutional VCs do. This long of a time horizon is often in conflict with the typical corporate executive, including CEO, tenure that tends to be 3-5 years. Establish the right metrics and Key Performance Indicators (KPIs) for assessing the risk and the performance of each of these innovation-related initiatives. Financial return by itself is not the right metric. Learn to support intrapreneurs and help them develop their internal startup ideas, rather than paying attention only to external startups and their teams. Understand how corporate culture will contribute positively and negatively to the disruptive innovation efforts. Innovation efforts are led by the C-Suite (CEO, CMO, Chief Digital Officer are the executives we see most often leading these efforts), are supported by the board but they need to involve every layer of the corporation. Understand how to best integrate successful results back into the business given a particular culture since there may be strong resistance to such integration particularly by middle management. We have entered a period characterized by breakneck innovation pace occurring in many fields and impacting all industries. The traditional centralized corporate R&D model can no longer consistently drive disruptive innovations because innovation-creation is now distributed and is as likely to be created by a startup as it is by a large company. To address this reality corporations must effectively integrate venture investing with intrapreneurship, business development and corporate development. The members of Silicon Valley’s ecosystem can be great long-term partners in this effort to re-inventing disruptive corporate innovation by providing best practices and a steady stream of innovative companies. Good blog, as always. It provokes as many thoughts as it solves. I tend to think of something like this moving us down a path where the end is still a ways to go. Both large and small companies innovate. Large companies get mired overall but can have skunk works that are quite effective. Arguably, the Innovators Dilemma book by Clayton Christenson, suggests that smaller groups of people tend to innovate faster or more often. 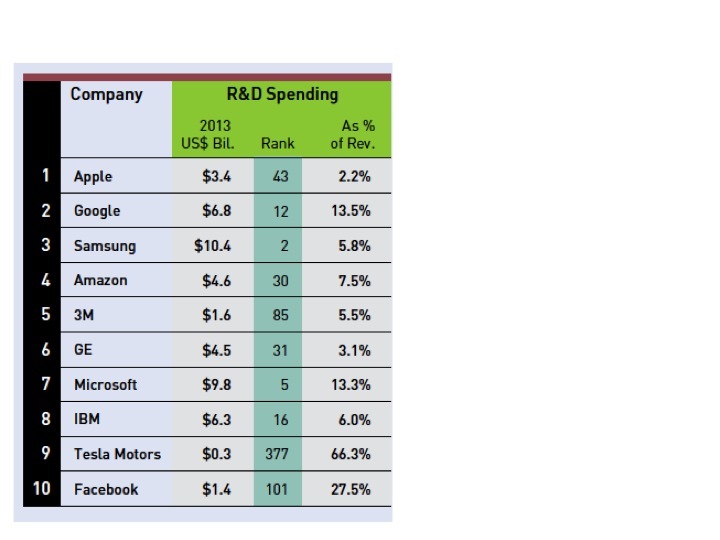 Have you seen any statistics that correlate innovation per R&D dollar? What about statistics on disruptiveness — seen anything like that?